Dr. Coffee’s Cafe, the first kid-friendly coffee shop in Regina is located in the former Yaegers’ Furs building on 11th Ave near Albert St.
REGINA — It’s been months since you had an intellectual conversation. Your days are mostly spent reading the Magic School Bus or building forts. When the baby’s napping, you work your way through the endless piles of half-folded laundry. Four-word sentences are now the norm. Oh, what you’d give for a stroller-friendly café where you could order a latte and indulge in some adult conversation. Your luck just changed. 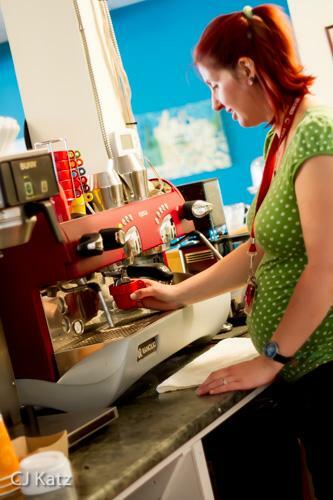 Dr. Coffee’s Café is the first kid-friendly café in Regina. The shop joins a growing number of kid-friendly coffee spots across Canada and the U.S. These comfy locales with kiddie play areas and a menu board of sophisticated espresso-based drinks and specialty teas are an oasis for parents craving a sense of normalcy. They are spots where baby Sophia or little Liam can interact with other tots while you de-stress with a full-bodied macchiato, read the paper or share parenting stories with other stay-at-home mommies and daddies. Opened on April 13, Dr. Coffee’s Café occupies the bottom of a 1928 heritage brownstone on 11th Avenue near Albert St. Designed by Reilly, Warburton & Reilly, it was originally built for Yaeger’s Furs Ltd. Indicative of the era, the upper exterior features a unique frieze of beavers, shells, oak branches and maple leaves. Since vacating in 1969, there have been many enterprises occupying the space, including a restaurant and most recently, a grow-op cultivating medicinal marijuana. Dr. Coffee is the latest tenant and they have dramatically transformed the main floor. To reflect the eclectic style and rich hues of that time she decorated the space with bright purple and teal blue. She scoured second-hand shops for sofas, armchairs and coffee tables. A huge floor to ceiling window and original local artwork brighten the space. Not exclusively a play café, a big chunk of this funky bohemian art deco inspired space is definitely kid-friendly. As you enter, an area off the left is devoted just to children with buckets of toys, a colourful play mat, and a wall-mounted chalkboard. A Swiss cuckoo clock marks the time. To divide the space there is a book exchange area where you can drop off and pick up vintage books. The front of the shop is all comfy furniture so feel free to bring a book or surf the net on your laptop. Adding to the eclectic nature of the space, Townsend may just be the only coffee shop owner in the world with a PhD in coffee. Hearkening from Yorkshire, England, her PhD thesis in geography was on the concept of quality in the specialty coffee industry. “I finished my masters in 2008 and couldn’t get a job so I worked for a coffee chain in the U.K. The work situation was dire,” she remembers. She decided to pursue her PhD, which brought her to studying the coffee industry. “It was cutting edge at the time,” she says of her thesis. She published her work in a book called Spilling the Beans, available on Amazon.ca for the low price of $124. No. that’s not a typo — even Townsend laughs at the cost. In lieu of investing in the book, Townsend is happy to spill the beans on the coffee industry in person. As much product as possible is locally sourced, including the beans, which are roasted at The Green Spot. The lineup changes regularly and according to season. Currently there is a Papua New Guinea medium roast, an Indian Monsooned Malabar light roast and a Costa Rican Tarrazu dark roast. In addition to espressos, cappuccinos and lattes, there are drip coffees and pourovers as well as specialty teas and London fogs. And for the little ones there are babyccinos served in colourful espresso cups with steamed milk and a sprinkle of cinnamon. The baking and lunch ingredients come from Local & Fresh, a new Regina delivery service that supplies local product direct to the customer. They recently added a wholesale division to supply shops like Dr. Coffee. In the pastry case you’ll find pink and blue macarons from le Macaron and big fat Suzy’s Cinnamon buns. There are also light lunches with soup from Soup … Simply along with paninis and empanadas. So, ditch the laundry — I promise you it’s not going anywhere — load up the stroller and the diaper bag and head over for a little playtime, a great coffee and some adult conversation.